I threw this dinner together using my brain as my recipe book. I will give credit to The Homebrew Chef Sean Z. Paxton for the recipe that inspired the gravy for tonight’s dinner. Not to mention this was my first time cooking with wine and first time braising. 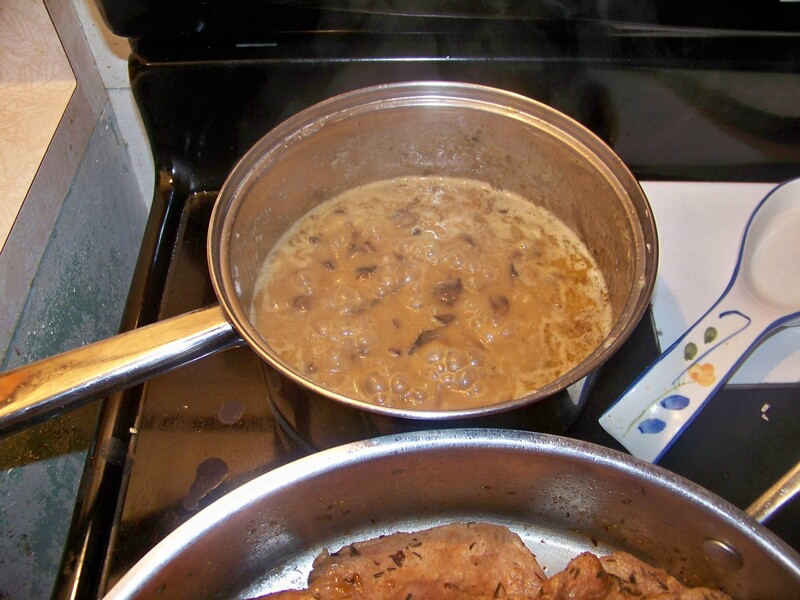 The gravy was started as in the recipe sauté the shallots in butter, add the mushrooms and reduce. I did cheat and used button mushrooms. I deglazed that pan with the Barefoot Pinot Grigio. I added my chicken stock, which was two cans of cheap broth boiled down some and a dollop of chicken stock flavoring added. I left that on to simmer the entire time dinner was cooking just combining and intensifying the flavors. I seasoned the pork with salt, ginger, and coriander. 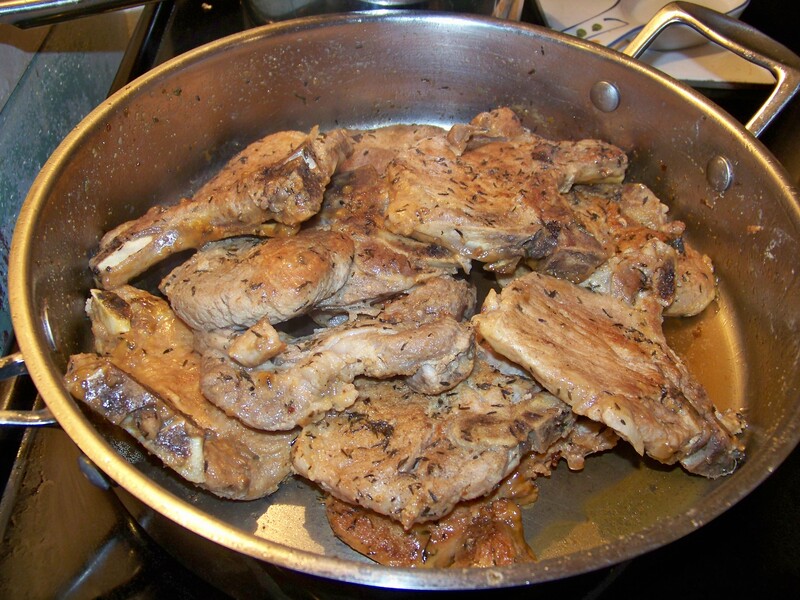 I seared the pork chops in my large stainless skillet, which still wasn’t big enough to fit all the chops. After browning I deglazed the pan with Barefoot pinot grigio. Then placed the pork back in to make sure it was staggered so there would be adequate steaming and cooking. Covered and left to simmer over medium heat. 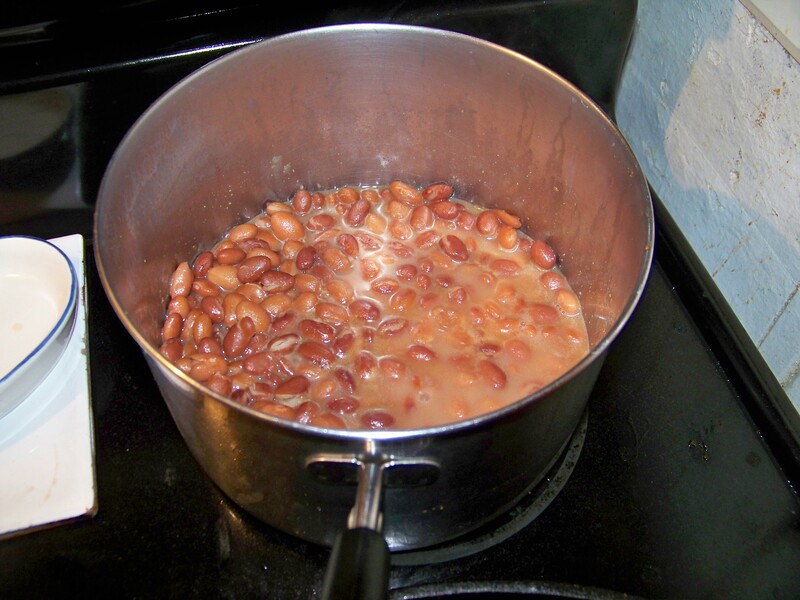 The beans were a combination of pintos and kidneys. Seasoned with coriander and ginger and left to simmer. As you can see I used some different spices through this dinner. I just figured I would mix it up and change it from the usual salt, pepper, and garlic. The wine seemed to have a bright citrus quality so I thought the coriander would play well with that and the ginger went nice with all of it. Beans Beans the musical… oh never mind. 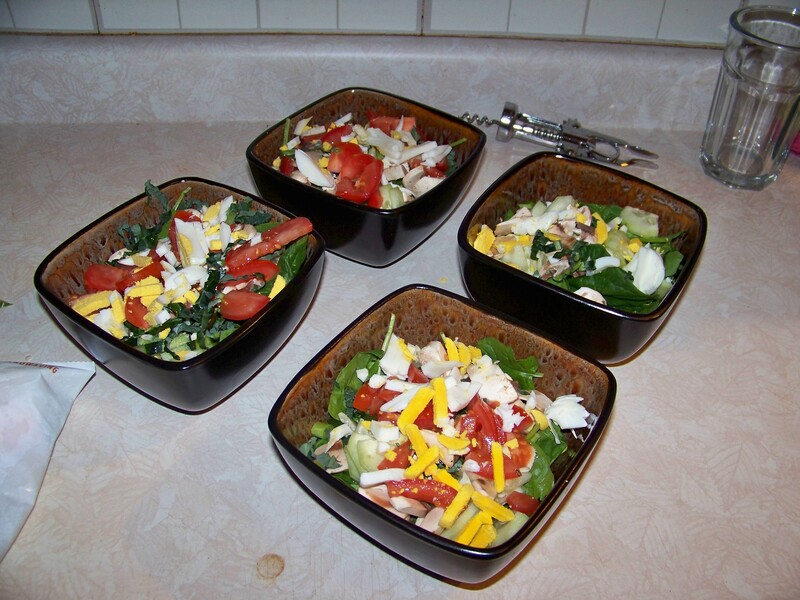 Salads were a common salad for this house. Baby spinach, mushrooms, cucumbers, scallions, tomatoes and hard-boiled eggs. With various toppings the difference for this one I used truffle oil and sherry vinegar as a dressing. I like the way sherry vinegar stands up to the oil it makes for a very good dressing. To finish up when the pork chops were done. I deglazed the pan again with what was left of the white wine. Let that simmer for a bit and poured that juice into the gravy mix little by little for taste. I stopped adding when the wine flavor started showing through. I just wanted it to contrast the richness of the butter and mushrooms not over power the dish. I might say that everything turned out amazing. 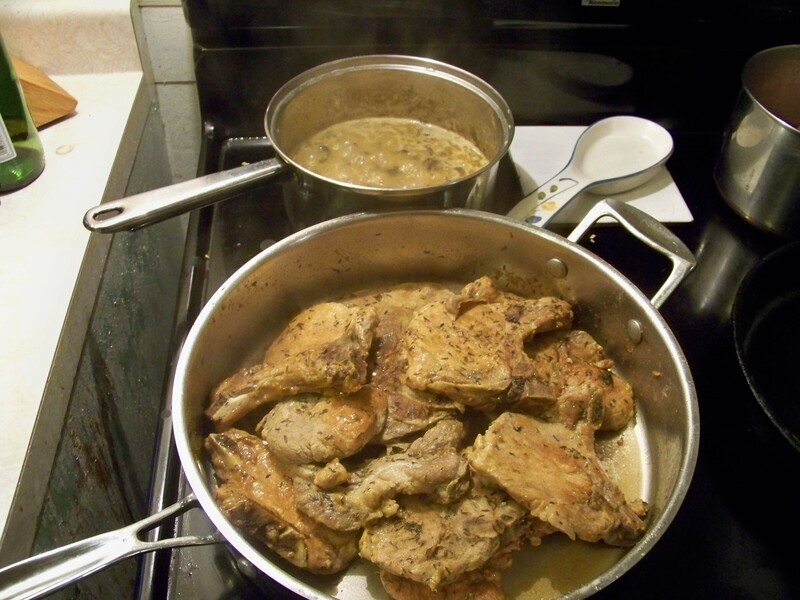 The gravy was a bright light gravy which went awesome over the fork tender pork chops. This meat just fell apart. The beans were great the coriander lightened up the richness of the pintos. The salad, specifically the dressing was great. I am going to have to play with this truffle oil a bit and see what other uses I can come up for it. Dinner turned out great. My pickiest and most honest critics, my wife and son, agreed. I was very pleased with it because not a single recipe was brought out. I just got adventurous and played around. You will never learn anything in the kitchen or anywhere else if you don’t venture on your own once in a while. I’m sure someday there will be a huge failure but that is to be expected and almost strived for. If you don’t go over the limits how will you ever know where they are. Here are Some books that might get your juices flowing.